All in One Grammar is specifically designed for Italian students. 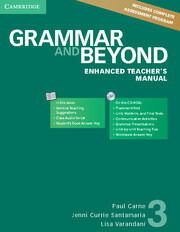 It covers the grammar students need at A1/A2 to B1 level and beyond. All in One Grammar provides complete coverage of the grammar needed for the five years of the 'scuola superiore', and develops listening skills at the same time. It includes the full range of PET and FCE exam tasks from the Reading, Writing, Listening, and Use of English papers in a companion book to be used as test material, and it contains helpful grammar explanations and a grammar glossary. 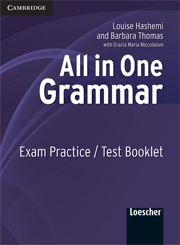 This booklet provides exam practice and test exercises for students using All in One Grammar.